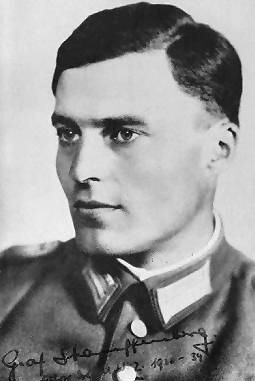 Claus von Stauffenberg was born into an old South-German Catholic aristocratic family, and grew up at a time when post-World War I Germany was trying to come to grips with the notion of representative democracy, as well as a punitive peace treaty, imposed by a coalition of victors intent not on justice but revenge - a combination of circumstances ripe for exploitation by demagogues. One of three largely like-minded brothers, he was a supremely intelligent, idealistic, practising Christian (in the best sense of the word). He believed that social position conferred an obligation of social responsibility. He did not believe in some of the more egalitarian tenets of "democracy", but had a practical commitment to human rights. He was a handsome man, and reaped the rewards with which society rewards beauty. He was eloquent and, when appropriate, outspoken. He had extreme moral and physical courage. Although he loved literature, music and architecture, he chose to join the army in 1926. In 1930, he was commissioned into the cavalry, the 17th Cavalry Regiment of Bamberg, as a lieutenant, having graduated "first" in his class. Between 1936 and 1938, he attended staff college and again graduated "first". His peers and superiors from this time onward judged him with high admiration and respect, both as soldier and as human being. At first neutral, cautious and non-judgemental towards the Nazi regime, he quickly became disillusioned as he, unlike most Germans, sought out information about the policies and behaviour of the Third Reich's leadership. Following the annexation of Czechoslovakia, the destruction of Germany's synagogues, and the increasing persecution of Germany's Jewish population during 1938 and 1939, he is known to have spoken out publicly, and he also began to study the techniques of the "coup d'�tat". After the start of World War II, Stauffenberg, as well as the steadily increasing number of opponents of the Hitler regime, found themselves in a quandary, on the one hand detesting the regime on moral and practical grounds, on the other facing their duty to the nation as soldiers. "Vital decisions for the future of the nation are at stake. History will indict these commanders (who blindly follow Hitler's orders) of blood guilt if, in the light of their professional and political knowledge, they do not obey the dictates of their conscience. A soldier's duty to obey ends when his knowledge, his conscience, and his sense of responsibility forbid him to carry out a certain order." This view led Beck to join the efforts to remove and later to assassinate Hitler, and would cost him his life on July 20, 1944. Editorial Comment: The above principle is at the base of the professional soldier's code of behaviour. Sadly, many modern professional soldiers seem to ignore it, here in democratic countries now, just as in Germany then. Eventually, Stauffenberg and others, solved the dilemma by separating their loyalty to country and humanity from their obligation to their government. In addition, Stauffenberg also had the moral and physical courage to take action, unlike the majority of opponents (especially among the senior officers) who only talked about it. His talents as a staff officer were quickly recognized, and he was given increasingly more responsible assignments as the war progressed, after 1940 as a member of the elite General Staff. Once there, he quickly realized that the reputation of the German General Staff was based more on history than current ability. "Our command structure is even more absurd than what the most experienced General Staff officers could have come up with, had they been asked to develop the most absurd command structure imaginable." at the German War College during 1941. One of the remarkable things about statements like the above, and others made by various members of the military resistance movement during discussions intended to widen the circle of opposition to the Hitler regime, is the fact that there were no betrayals to the Nazi security apparatus. This makes the fact that so few senior officers were prepared to act even sadder. One should also not forget, however, that very few people were in a postion to act, whether by means of a direct attempt on Hitler's life, or the method preferred by most (but of course, not based on reality), namely the arrest and trial of Hitler and his immediate henchmen. The German resistance movement to the Nazi dictatorship was larger and more active than is generally known. Publicity of its existence was suppressed for many reasons. They're obvious before 1945, reprehensible afterwards. German diplomats, politicians, military and civilian personnel tried repeatedly between 1934 and 1944, not only to kill Hitler, but to warn the British government of developments. But, the British upper class members of government (like American industrialists and politicians) were riddled with Nazi sympathisers, who not only ignored all warnings, but made life difficult for surviving resistance members after the war for fear of exposure. For a detailed account of the last attempt to remove Hitler from power, including the sociological background necessary to understand what motivated those who took part, I highly recommend Hoffmann's biography in English and von Krockow's in German (which, I hope, will soon be translated into English). The latter is particularly penetrating because the author has a deep understanding of the development of Prussian & German society (both its positive and negative aspects) since the 17th century, and thus helps the reader make sense of what often seems confusing about "typical German" behaviour. It is an indispensable historical work of high literary quality as well. Peter Hoffmann, Stauffenberg - A Family History, 1905-1944, Cambridge University Press, 1995 - The most exhaustively researched biography in existence. Well and interestingly written. Military background and knowledge of German history is helpful to reaching an understanding of the interplay of the various psychological imperatives at play. The author is a professor of history at McGill University, Montreal. Morris Janowitz, The Professional Soldier, The Free Press (Collier-Macmillan), Revised Edition, 1971 - Although not dealing with Stauffenberg, and focused exclusively on American military professionalism, this book is an excellent attempt to explain the "professional military ethos". Christian Graf von Krockow, Eine Frage der Ehre, Stauffenberg und das Hitler-Attentat vom 20. Juli 1944, Rowohlt-Berlin Verlag, 2002 - The most recent evalution and biography of Stauffenberg, written after, and in the light of political developments since, the WTC attacks of September 11, 2001. Joachim Kramarz, Claus Graf Stauffenberg, Das Leben eines Offiziers, Bernard & Graefe Verlag, 1965 - First major biography of Stauffenberg's life. Bodo Scheurig, Claus Graf Schenk von Stauffenberg, Colloquium Verlag, 1964 - A short, psychological study of Stauffenberg's life and of the July Uprising. Wilhelm von Schramm, Aufstand der Generale, Kindler Verlag, 1964 - Detailed tracing of the military resistance and implementation of the July uprising in France. Hans Hellmut Kirst, Aufstand der Soldaten, Verlag Kurt Desch, 1965 - A fictionalized account of the July 20, 1944 uprising, based extensively on original sources - an excellent introduction to the personalities and events.